The genius of Leonardo da Vinci is undeniable. Now, in a beautifully designed app by the Royal Collection Trust, anybody can learn about human anatomy through his stunning anatomical drawings. The app is divided into two sections: the story and the drawings. Within the story section, app users are walked through da Vinci’s life and given an historical perspective of the study of the human body. 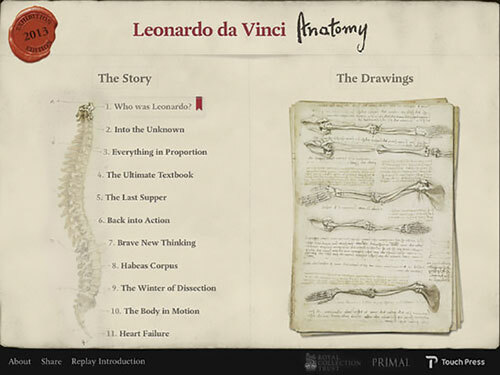 The drawings section of course contains the images of da Vinci’s sketches, which display beautifully on the iPad. Users can view the original Italian script or view an English-translated version. App users can browse the entire collection of images or view particular subsets of images as defined by the medium in which they were drawn or the time period during which they were created. Additionally, the app includes a small number of interactive drawings onto which animated anatomical models are overlaid. Jeffrey M. Taekman, MD and Melanie Clay Wright, Ph.D.